Xcode is the complete toolset for building Mac apps and iOS apps — and with Xcode 5, the tools do more than ever to help you create fast, efficient, high-quality apps. Xcode automatically configures your apps to use the latest Apple services, manages your many images in a unified asset catalog, and helps you design an app that looks gorgeous on iOS 7 or OS X Mavericks. Xcode 5 makes it incredibly easy to create and run tests, analyze your code, and monitor performance. And with access to continuous integration baked right in, your team can create better apps than ever before. Xcode 5 automatically configures your app to enable Apple services such as iCloud, Passbook, or Game Center, directly within the IDE. The new capabilities editor makes it as easy as flipping a switch to enable Apple services. Simply enter your Apple ID, and Xcode will manage your teams, certificates, and entitlements for you. Xcode will add the proper frameworks, create the appropriate provisioning profiles and entitlements, and sign your app automatically when you click ‘Run’. Creating a quality app requires that you write comprehensive tests. Test-driven development is easier than ever with the new Test Navigator in Xcode 5 which helps you create, edit, and run your unit tests. A single click can run individual tests, or a selected group. The Assistant editor provides new test-specific categories that automatically place your tests and application code side by side. Xcode 5 works closely with OS X Server for OS X Mavericks to easily create ‘bots’ that continuously build your app, execute your complete test suite, and run the Xcode static analyzer to find potential bugs. You can create a new bot in only a few clicks, and immediately start it running on any Mac in your network. While the remote Mac is doing all the integration work, Xcode on your local machine displays the build and test reports. A nightly bot is great for generating a regular release for your QA team. Bots can also be configured to execute on every check-in, alerting committers immediately when something is broken. Bots can even test your iOS app on connected iPhones and iPads, surfacing any device-specific bugs. Auto Layout is a powerful technology that allows you to create a single user interface which automatically adjusts to screen size, orientation, and localization. 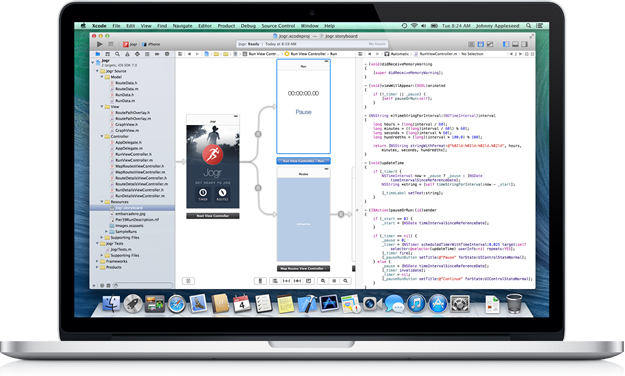 With Xcode 5, Interface Builder’s support for Auto Layout has been greatly enhanced. Interface Builder offers as much or as little help as you like, giving you a free-form canvas on which to create your next great app. Xcode offers helpful alerts when constraints are missing or mis-configured, and Interface Builder can even fix the layout for you. A beautiful app is composed of many images: icons for iPad, iPhone, and Mac, launch screens for different screen sizes, and all your custom artwork. Asset Catalogs, labeled as .xcassets in Xcode 5, make managing your images much simpler. You can work with all versions of each image without managing individual files, or memorizing filename conventions. The Asset Catalog can even create image ‘splits’ that enable your images to scale dynamically with the interface’s layout, while keeping the file size small. New debug gauges in Xcode 5 show resource consumption data at a glance, including CPU, memory, energy use, iCloud, and OpenGL ES. The gauges themselves add very little overhead while your app runs, making it obvious when CPU or memory usage spikes, and alerting you to an otherwise hidden problem long before your users see it. Clicking a gauge reveals a full report, complete with a preliminary diagnosis of what may be plaguing your app. You can then click a single button to launch Instruments, which will immediately begin performing a deeper analysis of your app’s performance. Built on the powerful LLDB debugging engine, the Xcode visual debugger in Xcode 5 is cleaner and more readable, and the Data Tips that hover over your code are more responsive. Variables in either view are formatted to be easier to understand at a glance, and you can now use Quick Look to quickly peek at an image, web page, bezier curve, or a document in memory. You can even print the object within the editor using a single click. The new top-level Source Control menu always shows the currently active branch of the project you are working on, and gives you quick access to switch, create, and merge branches. You’ll never need to leave your code to create a new feature branch, or fix a bug. If you don’t remember writing the code in front of you, you can check who to blame for that line, right in the editor. The new Accounts preference in Xcode gives you a single place to manage all your repositories, and OS X Server for OS X Mavericks can even host Git repositories for you and your team. Xcode 5 developer preview requires OS X 10.8 or above. It does not run on earlier versions of Mac OS X.
Xcode supports development for iOS 7, OS X 10.9, and OS X 10.8. Instruments requires OS X 10.8.4. Previous story Path Finder 6.2.1 – Powerful, award-winning Finder alternative.